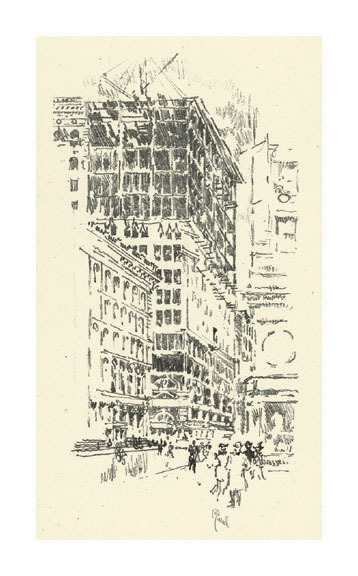 Complete set of 12 lithographs published by The Society of Iconophiles, New York, 1905. Contained in the original navy, linen-covered paperboard clamshell box, with letterpress printed cover wrapper and index page. The impressions printed on various types of antique paper, each spot glued at the top sheet corners to a heavy cream wove support sheet (17 1/4 x 11 5/8 inches). Minor wear to the box, slight scattered foxing to the support sheets; the prints generally in excellent condition, as published. 1. 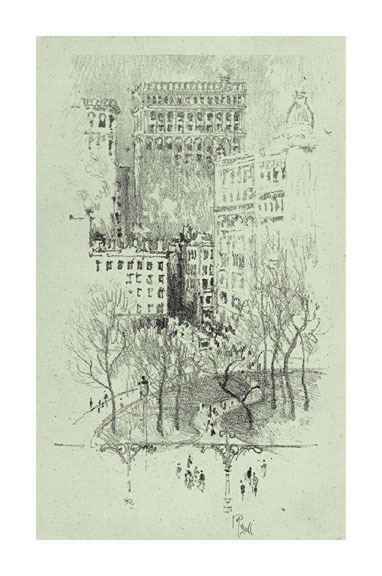 Battery Park - 1904, Lithograph. Wuerth 144. Edition 100. Signed in pencil, lower center. Image size 9 1/4 x 6 5/8 inches (235 x 168 mm); sheet size 11 5/8 x 8 1/8 inches (295 x 206 mm). A fine impression, on antique cream laid paper, with full margins (5/8 to 1 1/2 inch), in excellent condition. The Society of Iconophiles blindstamp in the lower left margin. 2. 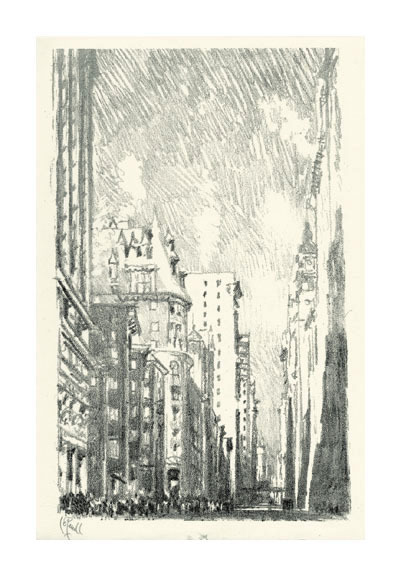 Broadway from Bowling Green - 1904, Lithograph. Wuerth 150. Edition 100. Signed in pencil, lower left margin. Image size 10 7/8 x 6 5/8 inches (276 x 168 mm); sheet size 11 5/8 x 8 1/4 inches (295 x 210 mm). A fine impression, on antique cream wove paper, with full margins (1/4 to 7/8 inch), in excellent condition. The Society of Iconophiles blindstamp in the lower left margin. 3. 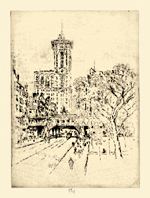 Broadway Towers - 1904, Lithograph. Wuerth 151. Edition 100. Signed in pencil, bottom center margin. Image size 11 1/8 x 6 1/8 inches (283 x 156 mm); sheet size 13 x 8 7/8 inches (330 x 225 mm). A fine impression, on antique buff laid paper, with full margins (7/8 to 1 1/2 inch), in excellent condition. The Society of Iconophiles blindstamp in the lower left margin. 4. 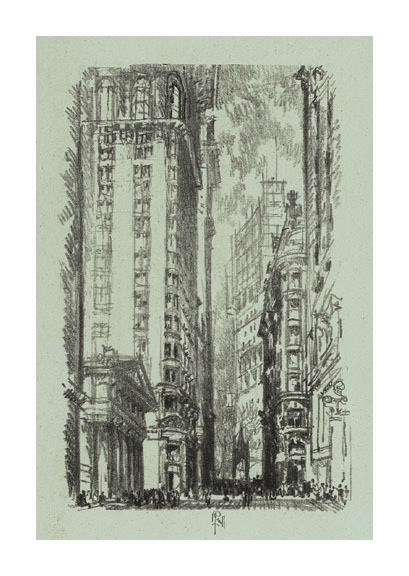 The Stock Exchange - 1904, Lithograph. Wuerth 146. Edition 100. 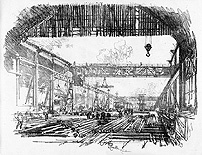 Signed in pencil, lower center. Image size 10 3/4 x 5 1/2 inches (273 x 140 mm); sheet size 13 x 8 1/4 inches (330 x 210 mm). A fine impression, on antique warm grey laid paper, with full margins (3/4 to 1 5/8 inch), in excellent condition. The Society of Iconophiles blindstamp in the lower left margin. 5. 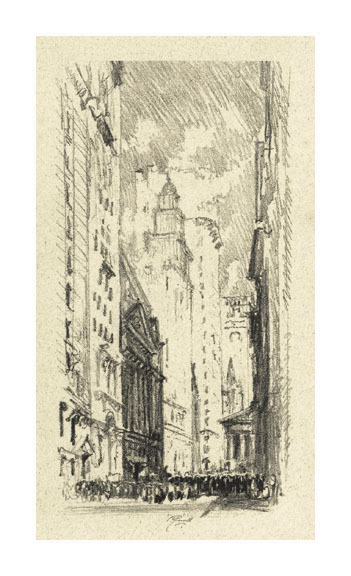 Nassau Street - 1904, Lithograph. Wuerth 158. Edition 100. Signed in pencil, lower center. Image size 10 3/4 x 6 1/4 inches (273 x 159 mm); sheet size 12 x 8 1/2 inches (305 x 216 mm). A fine impression, on antique pale grey wove paper, with full margins (5/8 to 1 1/8 inch), in excellent condition. The Society of Iconophiles blindstamp in the lower left margin. 6. 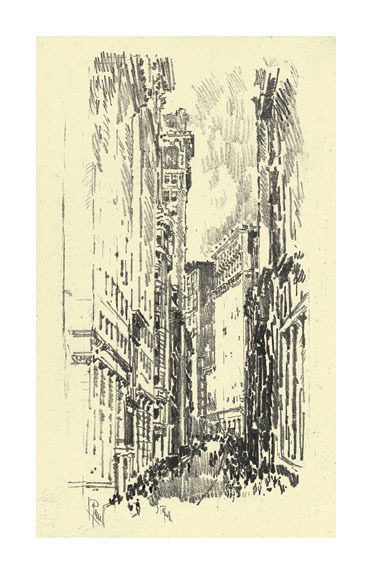 Pine Street - 1904, Lithograph. Wuerth 147. Edition 100. Signed in pencil, lower center. 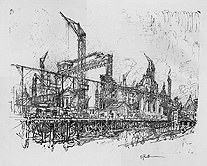 Image size 10 3/4 x 6 7/8 inches (273 x 175 mm); sheet size 13 5/8 x 9 1/4 inches (346 x 235 mm). A fine impression, on antique pale blue-green laid paper, with full margins (1 1/8 to 1 3/4 inch), in excellent condition. The Society of Iconophiles blindstamp in the lower left margin. 7. 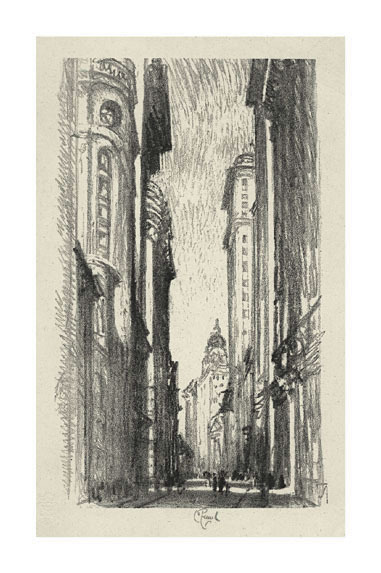 William Street - 1904, Lithograph. Wuerth 155. Edition 100. 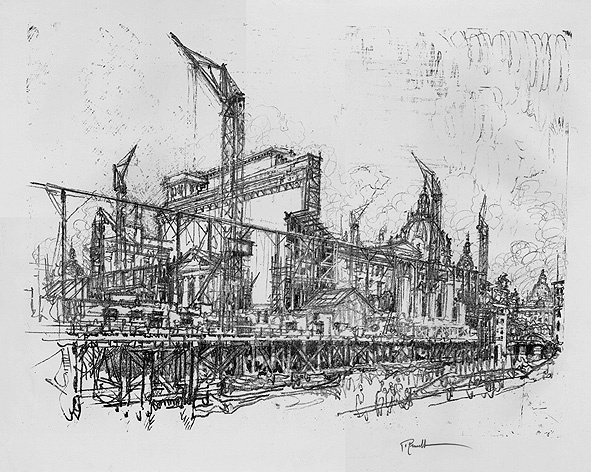 Signed in pencil, lower left. Signed in the stone, lower center. Image size 9 3/4 x 5 1/8 inches (248 x 130 mm); sheet size 11 x 7 1/2 inches (279 x 191 mm). A fine impression, on antique cream laid paper, with full margins (1/2 to 1 1/4 inch), in excellent condition. The Society of Iconophiles blindstamp in the lower left margin. 8. 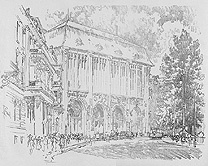 Building the Building - 1904, Lithograph. Wuerth 160. Edition 100. Signed in pencil, lower center. Image size 11 x 6 inches (279 x 152 mm); sheet size 12 7/8 x 8 3/8 inches (327 x 213 mm). 9. 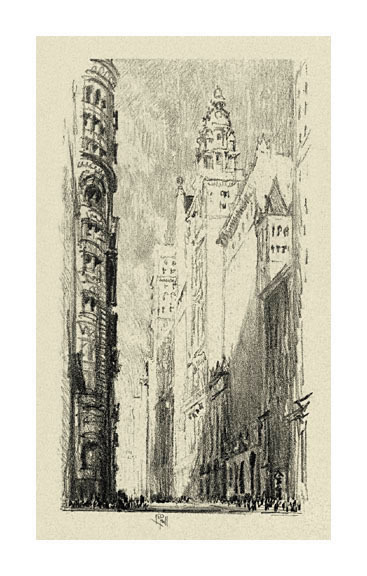 The Flat Iron - 1904, Lithograph. Wuerth 152. Edition 100. 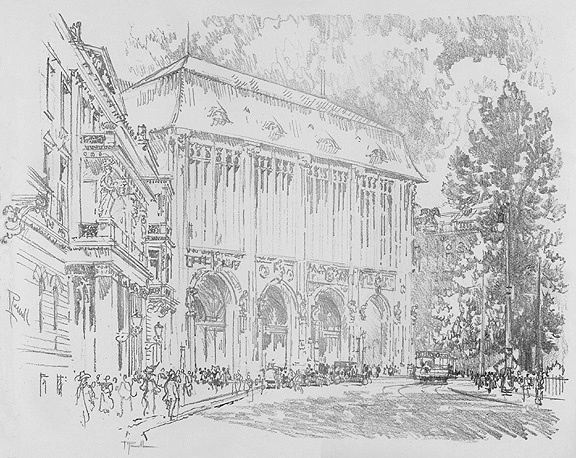 Signed in pencil, lower left. Image size 9 5/8 x 6 1/4 inches (244 x 159 mm); sheet size 13 3/4 x 8 1/2 inches (349 x 216 mm). A fine impression, on antique off-white laid paper, with full margins (1 to 2 5/8 inches), in excellent condition. The Society of Iconophiles blindstamp in the lower left margin. 10. 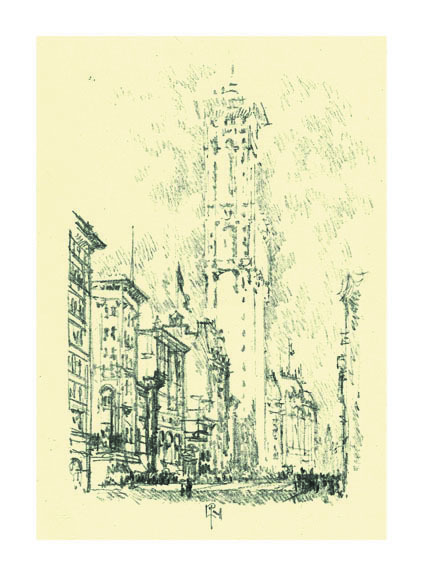 Union Square - 1904, Lithograph. Wuerth 154. Edition 100. Signed in pencil, lower center. Image size 10 3/4 x 6 1/4 inches (273 x 159 mm); sheet size 12 x 7 5/8 inches (305 x 194 mm). A fine impression, on antique pale grey-green laid paper, with full margins (1/2 to 3/4 inch), in excellent condition. The Society of Iconophiles blindstamp in the lower left margin. 11. 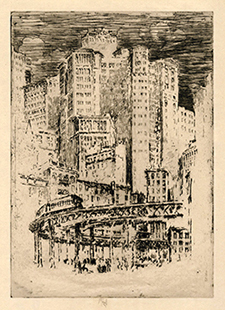 Broadway Above 23rd Street - 1904, Lithograph. Wuerth 156. Edition 100. 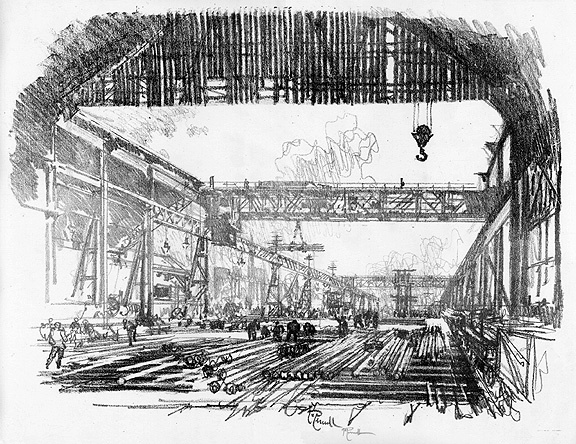 Signed in pencil, lower right. Image size 9 x 6 inches (229 x 152 mm); sheet size 11 1/4 x 8 inches (286 x 203 mm). A fine impression, on antique cream wove paper, with full margins (1/2 to 1 7/8 inch), in excellent condition. The Society of Iconophiles blindstamp in the lower left margin. 12. 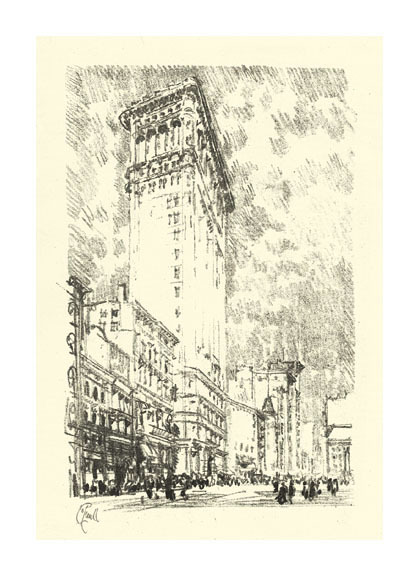 The Times Building - 1904, Lithograph. Wuerth 145. Edition 100. Signed in pencil, lower center. Image size 9 x 6 inches (229 x 152 mm); sheet size 11 1/2 x 8 1/4 inches (292 x 210 mm). A fine impression, on antique cream laid paper, with full margins (3/4 to 2 inches), in excellent condition. The Society of Iconophiles blindstamp in the lower left margin. Canyon No. 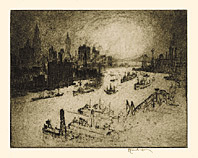 III- 1904, Etching. Wuerth 338. Edition not stated. Signed in pencil. Image size 11 7/8 x 4 7/8 inches (302 x 124 mm); sheet size 14 1/16 x 7 1/16 inches (357 x 179 mm). A superb, atmospheric impression, with rich burr, on cream wove paper; full margins (1 to 1 1/8 inches); paper discoloration on the four sheet edges, well away from the image; otherwise in excellent condition. 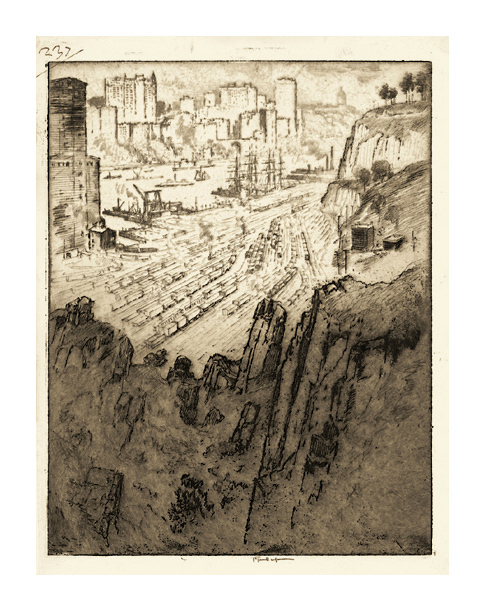 The Cliffs, New York - 1904, Etching. Wuerth 340. Edition c. 75. Signed in pencil. Image size 11 3/4 x 8 3/8 inches (298 x 213 mm); sheet size 15 1/8 x 10 1/4 inches (383 x 260 mm). A superb impression, with rich burr, on cream wove Japan paper; full margins (7/8 to 2 inches), in excellent condition. 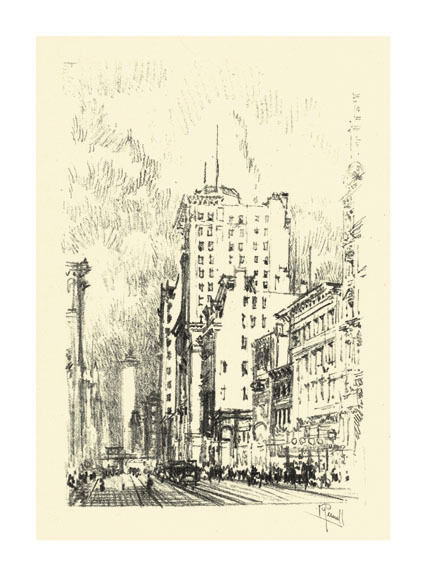 Times Building and 42nd Street - 1904, Etching. Wuerth 342. Edition c. 75. Signed in pencil. Image size 11 3/4 x 8 3/8 inches (298 x 213 mm); sheet size 15 1/2 x 10 1/4 inches (394 x 260 mm). A fine impression, with selectively wiped platetone, on cream Japan paper; full margins (7/8 to 1 7/8 inches), in excellent condition. 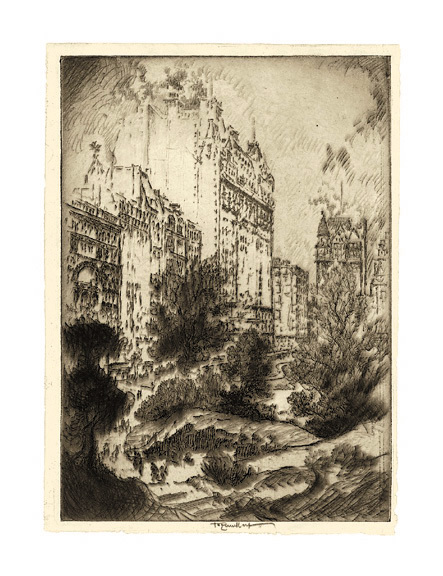 Palisades and Palaces - 1908, Etching. Wuerth 496. Edition c. 50. Signed in pencil. Image size 11 x 8 3/8 inches (279 x 213 mm); sheet size 13 3/16 x 9 1/4 inches (335 x 235 mm). A fine impression, with selectively wiped platetone, on antique cream laid paper; full margins (1/8 to 1 1/2 inches), in excellent condition. 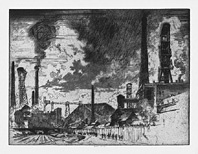 The Colliery, Ruhrort near Oberhausen - 1910, Etching. Wuerth 607. Edition c. 40. Signed in pencil. Signed and dated in the plate, lower right. 9 3/8 x 12 1/2 inches (238 x 317 mm); sheet size 11 1/4 x 14 1/4 inches (286 x 362 mm). A fine, rich impression, on cream laid paper, with full margins (3/4 to 1 inch), in excellent condition. Sunset, from Williamsburg Bridge - 1915, Etching. Wuerth 674. Edition c.100. Signed in pencil. Image size 8 7/16 x 10 7/8 inches (214 x 276 mm); sheet size 11 x 17 3/16 inches (279 x 437 mm). 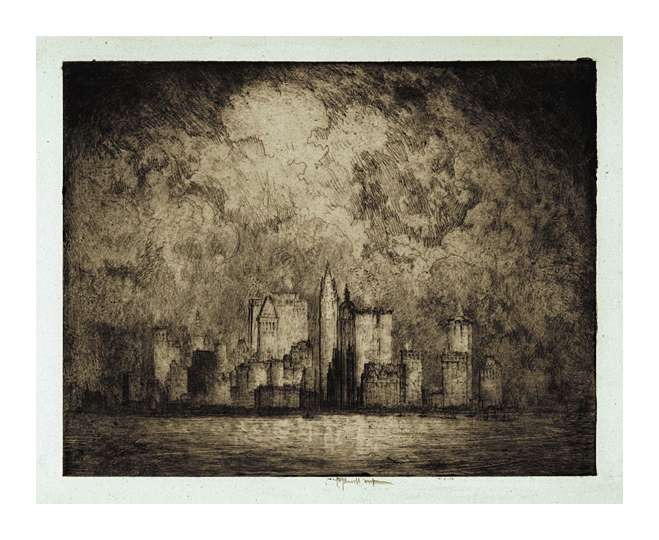 A superb, atmospheric impression, in warm black ink, with selectively wiped overall plate tone, on cream wove paper. With full margins (1 to 3 5/16 inches), in excellent condition. 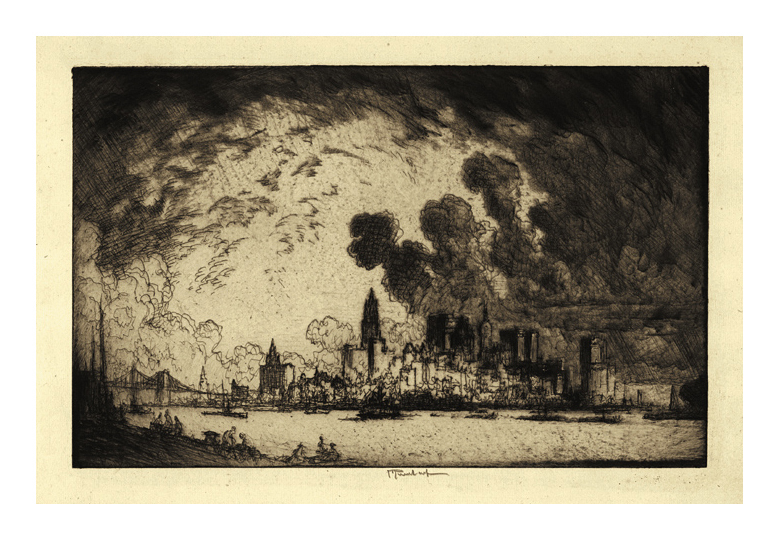 New York from Brooklyn - 1915, Etching. Wuerth 671. Edition c. 80. Signed in pencil. 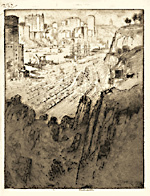 Titled in the artist's hand, bottom left sheet edge. Image size 7 7/16 x 11 15/16 inches (189 x 303 mm); sheet size 11 3/8 x 16 1/8 inches (289 x 410 mm). A superb, richly inked impression, in dark sepia ink, on antique cream wove paper, with full margins (1 1/2 to 2 1/2 inches), in excellent condition. 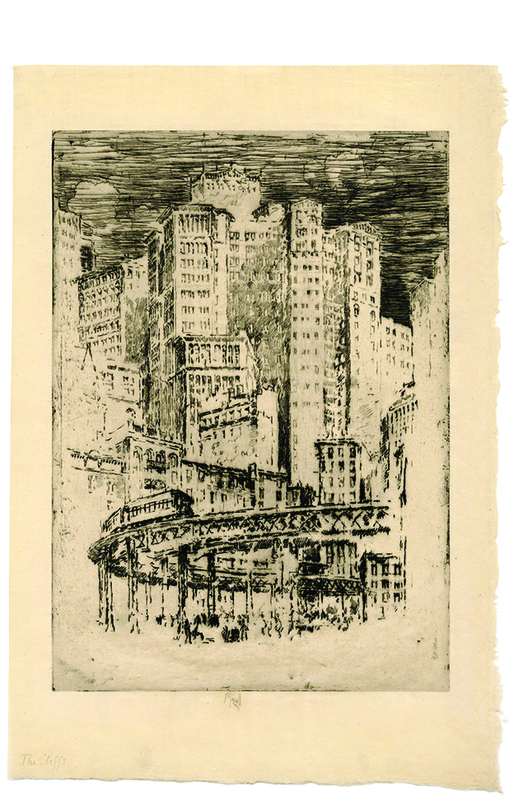 The City in 1915 - 1915, Etching. Wuerth 679. Edition c. 75. Signed in pencil. Image size 8 5/16 x 10 13/16 inches (211 x 275 mm); sheet size 11 1/2 x 17 1/4 inches (292 x 438 mm). A superb, atmospheric impression, in dark brown ink, on antique pale blue wove paper, with full margins (1 1/8 to 3 3/8 inches), in excellent condition. 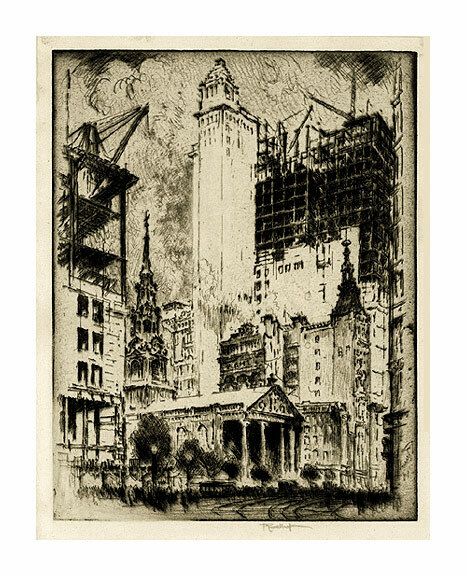 St. Paul's, New York - 1915, Etching. Wuerth 678. Edition c.100. Signed in pencil. Image size 11 x 8 1/2 inches (279 x 216 mm); sheet size 12 11/16 x 9 1/4 inches (322 x 235 mm). A superb impression, in dark brown ink, on cream laid paper; full margins (3/16 to 1 3/8 inches), in excellent condition. 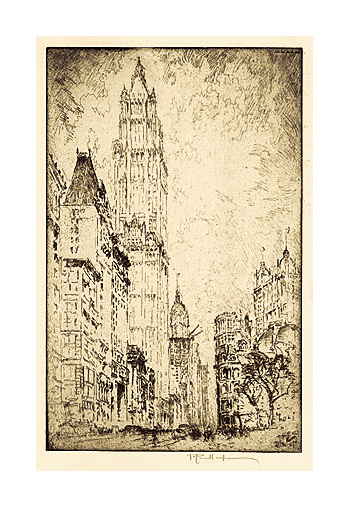 The Woolworth Building - 1915, Etching. Wuerth 675. Edition c.100. Signed in pencil. Signed and dated in the plate, lower right. Image size 11 7/8 x 7 1/2 inches (302 x 191 mm); sheet size 13 3/8 x 8 1/4 inches (340 x 210 mm). 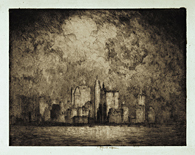 A fine impression, in dark sepia ink, with selective wiping and warm overall plate tone, on cream wove Japan; full margins (3/8 to 1 1/8 inches), in excellent condition. 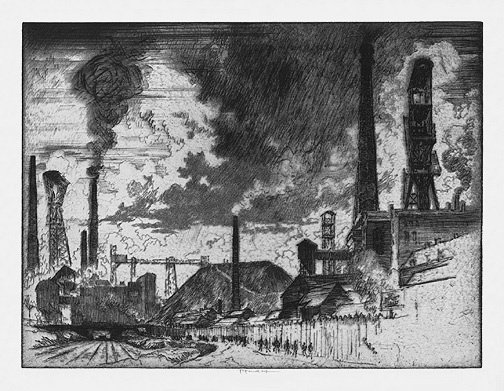 Reproduced in American Master Prints from the Betty and Douglas Duffy Collection, The Trust for Museum Exhibitions, Washington, D.C., 1987. 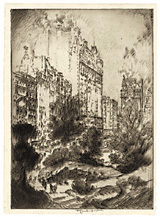 The Plaza from the Park- 1921, Etching. Wuerth 787. Edition c. 50. Signed in pencil. Signed and dated in the plate, lower right. Image size 10 x 7 inches (302 x 191mm); sheet size 10 1/2 x 7 1/2 inches (340 x 210 mm). 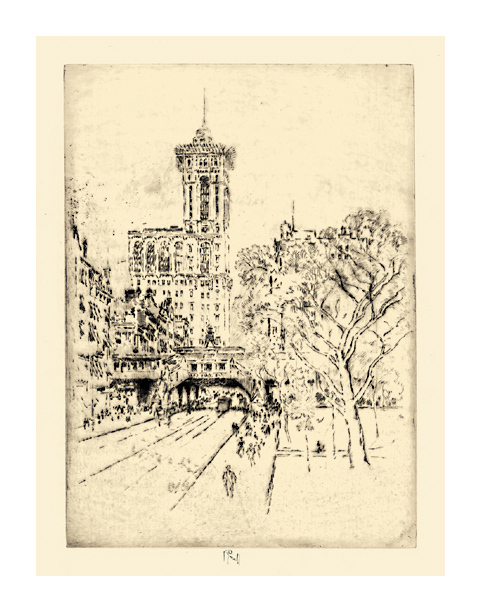 A superb impression, with overall rich burr and selective plate wiping, in dark sepia ink, on antique cream laid paper, with full margins (1/8 to 3/8 inch). Minor surface soiling and light toning to the margins; otherwise in excellent condition. Steel Bars for Shells - 1916, Lithograph. Wuerth 421. Edition 150. Signed in pencil. 15 3/4 x 20 3/4 inches (400 x 527 mm); sheet size 18 3/4 x 24 3/4 inches (476 x 629 mm). A fine, rich impression, on cream laid paper, with full margins (1 1/4 to 2 inches), in excellent condition. 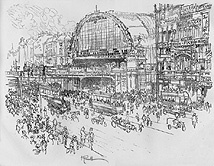 Museum Extension, Berlin - 1921, Lithograph. Wuerth 606. Edition 50. Signed in pencil. Image size 16 x 21 3/8 inches (406 x 543 mm); sheet size 20 x 26 inches (508 x 660 mm). A fine, rich impression, on cream wove paper, with full margins (1 5/8 to 2 3/16 inches), in excellent condition. 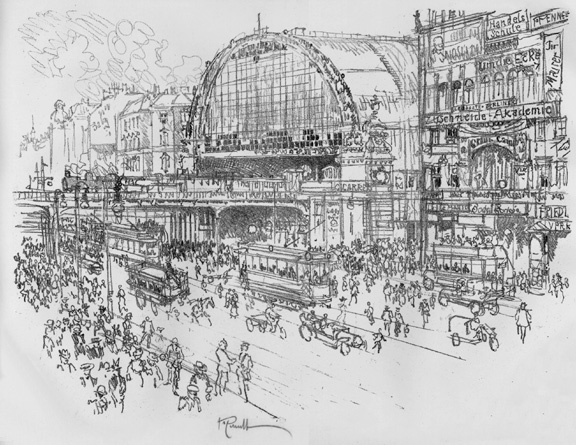 Station, Alexander-Platz, Berlin - 1921, Lithograph. Wuerth 610. Edition 50. Signed in pencil. Image size 15 1/2 x 19 1/4 inches (394 x 489 mm); sheet size 19 3/4 x 25 7/8 inches (464 x 657 mm). A fine, rich impression, on cream wove paper, with full margins (2 3/4 to 3 1/3 inches), in excellent condition. 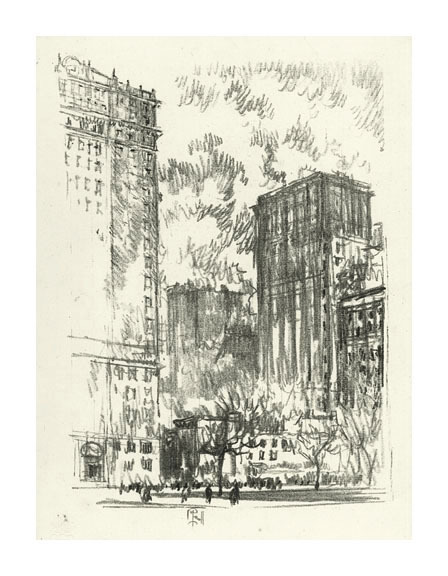 Wertheim, Leipziger-Platz, Berlin - 1921, Lithograph. Wuerth 611. Edition 50. Signed in pencil. Image size 14 3/8 x 19 inches (366 x 483 mm); sheet size 20 1/8 x 25 7/8 inches (508 x 657 mm). A fine, rich impression, on cream wove paper, with full margins (2 3/4 x 3 inches), in excellent condition.